Mother Of Murdered Backpacker Objects To Description As 'Underreported Terror Attack' : The Two-Way Rosie Ayliffe's daughter was stabbed to death last year. In an open letter, Ayliffe told President Trump that the attack was not terrorism — and urged against being led "into darkness and hatred." 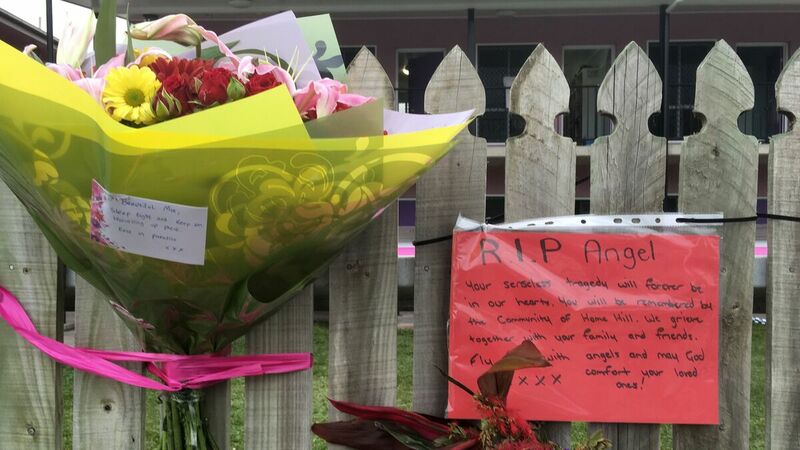 Flowers and well wishes are placed on a fence outside the hostel where British backpacker Mia Ayliffe-Chung, 21, was stabbed to death last year in a rural Australian community. A Frenchman was charged with her murder and that of another person, but while he allegedly said "Allahu akbar" during the attack, police found he showed no signs of radicalization. Rosie Ayliffe, the mother of a young woman stabbed to death last year at a hostel in Queensland, Australia, says she is "affronted" by the inclusion of her daughter's death on a Trump administration list of what it calls underreported terrorist attacks. The reference to her daughter's killing was "at best a crass and callous error," Ayliffe wrote in The Guardian on Wednesday, saying that her daughter's death was ugly and brutal — but not a terrorist attack. Mia Ayliffe-Chung and Tom Jackson, both of Great Britain, were killed at the hostel last August. The Trump administration included the attack in its list, ostensibly to support the president's claim that terrorist attacks are "not even being reported" by the media. As NPR has noted, the list includes attacks that received extensive coverage, including the Orlando Pulse nightclub shooting, the San Bernardino attack and the 2015 Paris attack. In the case of Ayliffe-Chung, her mother says the attack wasn't terrorism at all. The possibility that Ayliffe-Chung's stabbing was related to Islamic terrorism was "discounted in the early stages of the police investigation," Rosie Ayliffe wrote in an open letter to Trump published on Tuesday. The man accused of killing them, Smail Ayad, allegedly shouted "Allahu akbar" during the killing. He was also "apparently infatuated" with Ayliffe-Chung, as the Guardian wrote last fall, and was later said to have been preliminarily diagnosed with schizophrenia. Ayliffe says there's no evidence he was a practicing or believing Muslim. "Any fool can shout Allahu Akbar as they commit a crime," she wrote, and went on to say she had encountered respect, hospitality and courtesy from Muslims around the world. "The vilification of whole nation states and their people based on religion is a terrifying reminder of the horror that can ensue when we allow ourselves to be led by ignorant people into darkness and hatred." She expanded on her frustration in an opinion piece for the Guardian. She called for the White House to "take the trouble to get the facts right." Ayliffe also said her daughter, who was working in Australian cane fields when she died, had been treated like a "disposable commodity" by her employer and by hostel staff. "So Trump is right: there is a connection between my daughter and those travellers he wants to strip of their humanity and dignity in airports around the United States," she wrote. "But it's not the connection he would wish to make. The connection is that my girl's life was also held in scant regard by a harsh and unforgiving system that doesn't value basic human rights."